We were not so lucky. After begging and I think my classmate even cried, he said that he would not sign off on us getting out of his class. He told us the class would be good for us and us two girls would team up and train together through the semester. But, I didn’t want to get all bulky like a boy I complained. He just laughed. Everyday, my training partner and I would go to the locker room to change for PE and we would be envious of all the other girls getting in their cute dance outfits. We would get changed, get our weight lifting gloves, which were the only mandatory item to be purchased for class and head over to the stinky, old, windowless weight training room. Throughout the semester we learned how to lift free weights, bench press, cables, what getting taped and measured meant, what it was like to get schooled by the boys during outdoor sprints, and how gross boys can be in the weight room. At the beginning of the semester we had to do a physical assessment of what we could lift. I had never done a bench press before and my first attempt to the lift the bar was hilarious. Needless to say, I ended up having to bench some dumbbells instead. Over the following weeks, my training partner and I would eventually be able to lift the bar and we steadily added weight. By the middle of the semester we were both lifting the bar and could handle some 5 pounders on each side. At the end of the semester, I was able to do a max lift of 105 pounds. That meant I was lifting the bar with a 25-pound weight on each side. I was proud of myself, but still envious of the girls that got to take dance. I was grateful when the semester came to an end. The following semester I ended up having swimming and was glad to put that weight lifting semester behind me. It took me years to realize what that weight lifting coach had actually done for me. Over the years, I have been in and out gyms, but have consistently been a runner. About a year ago, I got back in the gym and got pretty serious about it. After breaking my left wrist and then breastfeeding two children, I was ready to get strong again. 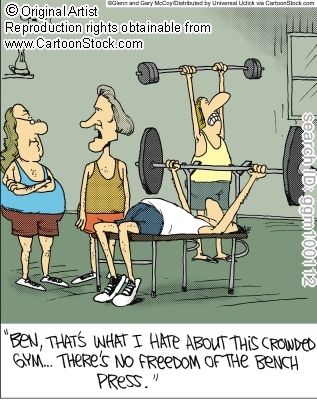 I was hitting the gym pretty regularly and would stare at the bench press everyday. I had no idea if I could even lift the bar anymore. I stuck with dumbbells as I worked my strength back up. After several months of dumbbells, I eventually made it over to the bench press and managed to do sets with 55 pounds. Over the last several months, I have stayed within the 55-70 pound range, never pushing my left wrist too hard. I was lucky enough to have a training partner in the gym today. Not feeling particularly strong or pumped, I got the notion in my head to see what I could max on the bench press. I started with 85 pounds and did 3 reps. Woohoo. 95 pounds and another 3 reps, go Jen go! I’m not going to lie, I did not have the confidence to go heavier, but my training buddy said 100 pounds…. 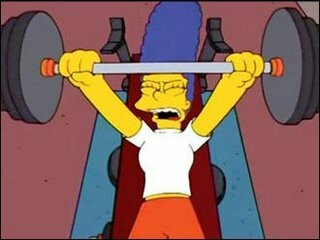 so, after some deep breaths, I managed to lift 100 pounds two times. This was quite the achievement for me. With only 5 pounds standing in my way, I decided to give it the old high school try. After putting 105 pounds on the bar and walking around the room a few times I laid down on the bench to see what I had. On the first attempt, I chickened out…. On the second attempt, I had to close my eyes and push the bar up with everything I had. I thought I had assistance, but my training partner said I pushed it up all on my own. I am quite proud of myself today. As a busy mom and professional, my physical training is primarily focused on running and triathlon/endurance training. I do try to get two to three hours of weight training in every week to help stay strong. What has it taken me years to realize about that weight lifting coach? I’ve learned how comfortable I am in the free weights section of the gym. I’ve learned that if I lift heavy, I will not get bulky. I’ve learned over the years how intimidated so many women are by the free weights section of the gym and that many women see this area as the boys area while they stay in the cardio section. One day my little girls will be in high school and I will subject them to the same kind of torture.